India vs Bangladesh Live Streaming Cricket Score IND vs BAN 1st Test: The live cricket score and streaming of Bangladesh vs India of Day 3 (Saturday) are available online. You can watch the BAN vs IND match without any problem. Feel free to catch the live updates throughout the maiden Test being played at Uppal Stadium in Hyderabad. The Hyderabad Test match is in the hands of the hosts as they have already scored a massive total of 687 runs for 6 wickets and declared their first innings on Day 2. Till the time of stumps, Bangladesh was able to score only 41 runs for the loss of 1 wicket. Today, it is the third day of the Test and starts at 9:30 am IST. The live telecast of the game on TV will be on Star Sports channels. Also, the audience can catch the updates on Hotstar. Irrespective of the result, it will be remembered for Virat Kohli and his double hundred. He made 204 before going back. Apart from him, Wriddhiman Saha played an excellent knock of 106 and not out. Based on the early trends, the wicket seems to be batting friendly as the likes of Kohli, Saha, Murali Vijay (108), Cheteshwar Pujara (83), and Ajinkya Rahane used the opportunity to its best. Now, the visitors are required to play with the same spirit and score some big runs to at least draw the match. They need to make the same team effort. Bangladesh batsmen need to stay on the wicket throughout the day as Ravichandran Ashwin and Ravindra Jadeja will be looking forward to unleashing their wrath and take wickets early and finish the game. The good thing for Bangladeshi team is that they have the opportunity to use the batting friendly wicket and also the weather is with them. Bangladesh ended the day 4 at 103/3 needing 356 more runs to win the Test and three sessions to survive. India declared during the tea break on 159/4 where Pujara remained not out on 54 and Virat Kohli scored a quickfire 38. 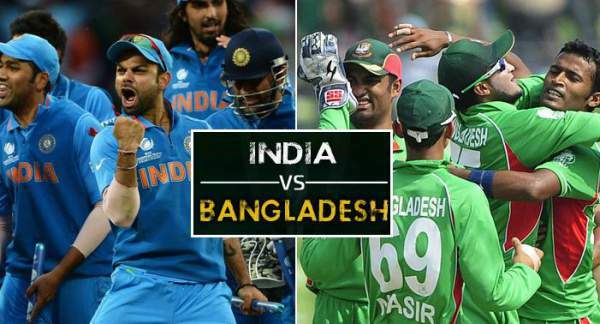 The IND vs BAN live streaming and tv information is available below. Live TV: STAR Sports 1, STAR Sports HD1, STAR Sports 3, STAR Sports HD3. Stay tuned to The Reporter Times for live cricket score, match highlights, full scorecard, ball by ball commentary, match result, the man of the match, and much more.